Patrick Willing, 10, waits for the server to load on the popular augmented reality video game, Pokemon Go, outside the Avon Public Library on Tuesday. The Avon Public Libary has been dubbed a "Poke Gym," resulting in a dramatic increase in foot traffic to the area. VAIL — The term “playing Nintendo” can mean a lot of things to a lot of people, but these days, it means getting out and walking around. The company that has been trying to get its users more active for decades — first with the Nintendo Power Pad in the ’80s, more recently with the Wii game console — has succeeded, and in a big way, with their Pokemon Go gaming app. On Tuesday, Nintendo surpassed Sony in market value, a rival that has dwarfed them since entering the gaming industry in the ’90s with the launch of the Playstation. Today, Nintendo’s chart looks like Mewtwo after being hit with a flip kick from Pikachu in Super Smash Brothers Melee — it’s going straight up. The company is now worth an estimated $40 billion. The “around the globe” part of that sentence has become particularly relevant to our area. 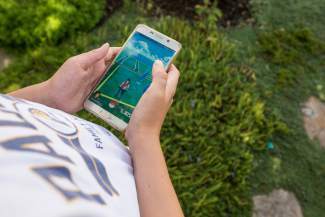 As visitors from around the globe come to Eagle County every year to enjoy activities to numerous to list, “playing Nintendo” has now been added to that list, via Pokemon Go. Diane Johnson says her son, 14-year-old Xaver, now knows the names of various sculptures and landmarks around town thanks to afternoons spent playing Nintendo. The popularity of the game in our area prompted the formation of the Avon Library as an official PokeGym, where players can meet other players and join teams, giving them a better chance to earn more points. The Avon Library PokeGym was put into the game by its designers due to demand for the game in the area, says Cathy Zaikis with the Eagle Valley Library District. Sarah Bean Thompson, a writer with the Association for Library Service to Children, says if you have a PokeGym in your area, you’re lucky. Zaikis and the Avon Library tried out an adaptation of the game on Tuesday to celebrate the conclusion of their eight week summer reading program. Kids tackle fitness challenges and read books as a part of the program. “Part of the program is being active, so we jumped on the Pokemon Go bandwagon,” she said. In her adapted version of the game, kids took paddle boats out on the lake in search of “Pokeballs” — beach balls adorned with Pokemon graphics. The balls were assigned a point value, and the kids with the most points at the end of the day won awards. “I wasn’t expecting them to swim,” she said, after seeing the kids jump out of the paddleboats after the Pokeballs. Braulio Aguayo, 12, and Luis Cervantes, 11, were among those to swim Nottingham Lake on Tuesday in search of Pokeballs. Cervantes said the reading program’s swimming version of Pokemon Go was as fun as the iPhone version. “I got a Squirtel, a Pikachu, and two Bulbasaurs,” he said. Zaikis said growing up in the video game era, in her life she has seen a lot of good come from playing Nintendo.